Sash windows have a certain aesthetic appeal which makes them great for traditional homes. Otherwise known as hung sash windows, they’re made up by a number of movable panels which form a frame. With wooden window frames you’ll add even more to the traditional feel, whilst utilising an environmentally friendly material. The sash window panes can slide open horizontally or vertically and have been used in the UK since the 1600s. They’re often found in Georgian and Victorian houses and can be made of any size. 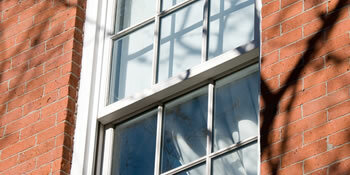 Why choose wooden sash windows? Sash windows are themselves a great choice to make your home stand out from the crowd, whilst giving the property a stunning visual look. Create a fantastic look for your property. Wooden windows are a class above other materials when it comes to appeal and they have a stunning effect on the external look of your home. Reduce noise pollution. With upgraded windows less noise will be able to enter your home, keeping you in peace and quiet throughout the year. Cut carbon emissions. As you’re burning less fuel for heat because of improved home efficiency, less carbon dioxide will be created and fed into the atmosphere. This is great not only for the environment but also for helping the Government meet EU targets. With wooden sash windows you’ll be able to create a stunning effect for your home, which goes particularly well with traditional properties. For up to four FREE wooden sash windows quotes, complete our quick form and hear from local, vetted and reputable companies. Homes are given an energy ranking depending on exactly how efficient they are and ratings are displayed in the data below. This varies from A, by far the most energy efficient, to G, the least efficient. With a higher rating you're more likely to have more affordable energy bills as more heat shall be kept in your home. You'll be able to increase your home's efficiency with insulation including upvc double glazing, loft lagging or wall cavity insulation. There are many different types of property in the United Kingdom and the info below illustrates the type of homes in Uk. Over the country the most popular property types tend to be semi-detached and terraced housing, however detached homes, flats and bungalows are also available. The pie chart underneath reveals the proportion of properties in Uk that are central heated and non-central heated. Central heating figures within the the greater part of UK homes, such as those on the gas grid and properties heated by oil and electric. The data beneath illustrates the spread of households heated up by various fuels. Around the UK the most frequent by far and away are gas heated houses, followed by electricity and then oil. Biomass boilers are also rising in popularity, heated by environment friendly products like wood pellets or agricultural waste.|Properties in the UK are heated up by a range of fuels, such as gas, electricity, oil, solid fuel and LPG boilers. Each fuel has a varying cost associated with it which means you can find yourself with cheaper energy bills by switching how your household is heated. Even solar thermal panels are being considered by many people as a way to lower heating bills for the many years to come.